Although there’s much confusion among cyclists and motorists, shared use paths like this one are not covered by the mandatory use law. Legislation to revoke the rule which forces cyclists to use a cycle track regardless of its condition is in the process of being finalised, the Department of Transport said. The national cycle policy includes a commitment to remove the current law, known as the “mandatory use” rule. That promise was originally made by Noel Dempsey, the transport minister in the last government, but has been slow to be delivered. Cyclists are currently required to use cycle lanes marked with the correct bicycle logo sign, but cyclists view this as unfair given the current state of the country’s cycle lanes It’s understood that a number of bodies including the RSA are against changing the law. “Provision for the removal of the mandatory use of cycle lanes is being provided for in the legislation, except for contra-flow cycle lanes and cycle lanes in pedestrian areas,” she said. You might do it everyday, but currently passing a car on the left often isn’t strictly legal – is seen as a legal grey area. 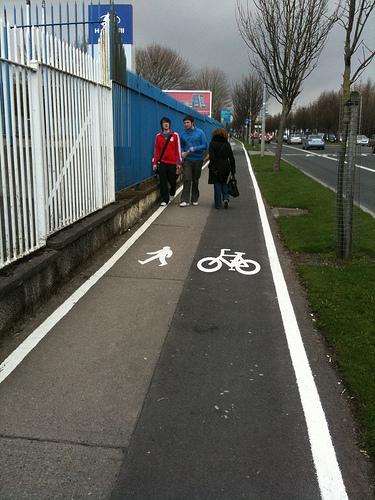 The department also is to change this to allow cyclists to undertake. The department however said it has no plan to implement a legal minimum passing distance of 1.5m when a motorist is overtaking a cyclist – the measure had been called for by cycling campaigners. I’m very pleased to see this finally reaching a conclusion. I only hope that the legislation change will be well publicised to minimise conflict amongst road users. It is a pity that a minimum passing distance is not being mandated though. I know it would be difficult to police, but it will make motorists more aware that vulnerable road users need space. Absolutely with Richard Berry. In other countries, drivers are aware that the safe distance for passing a bicycle is 2 metres, or six feet six. Passing on the left is not undertaking. Undertaking has two meaning – one is to agree to do something – ‘I undertake to abide by the law’ and the other is in the send of an undertaker – someone who arranges funerals. Whether you pass a vehicle on the left or the right it is still overtaking. Language usually evolves by force of general users — not officialdom. And the authors of the Oxford, Cambridge, Collins etc dictionaries are always playing catchup with a language which belongs to the people and not to them.